mavis and The Saatchi Bill. - Onestopmesothelioma!! Mavis Nye is no stranger to the spotlight. Since she stepped out in 2010 at the Mesothelioma UK Conference in London to share her story of mesothelioma and to fight for more effective treatments for all mesothelioma warriors, Mavis has made sure that the plight of mesothelioma victims is heard. 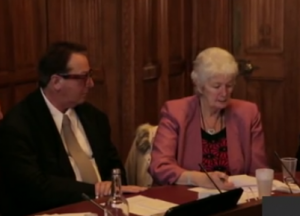 On February 24, Mavis’ voice was heard around the world when she took a seat next to Lord Maurice Saatchi of the House of Lords as he launched the public consultation period of the Medical Innovation Bill. The bill, introduced by Lord Saatchi and referred to as the Saatchi Bill, is intended to “help doctors innovate new treatments and cures for cancer and other diseases” without fear of retribution, as explained on Tumblr. Doctors will be able to “deviate away from standard procedures and innovate, safely and with the protection of the law” in order to offer patients effective treatments. For mesothelioma patients, like Mavis, who have exhausted their treatment options, this bill could mean the difference between life and death. “I back this innovation bill. And when do I want it? I want it today, because I might not be here tomorrow,” said Mavis during the panel discussion as she talked about the importance of the bill to her. Mavis has been battling mesothelioma for nearly five years. After countless procedures, surgery, radiation, and four rounds of chemotherapy, her doctors told her she has no more treatment options. But Mavis isn’t about to give up, so every day she surfs the internet hoping to find a breakthrough in cancer care that will give her one more chance at halting the growth of her mesothelioma. Although Mavis has not yet found her silver bullet, her quest has led her to become one of the biggest proponents of Lord Saatchi’s proposed bill. Mavis stumbled upon the Saatchi Bill during her research one day. She immediately realized the benefits this bill could offer her, and other terminally ill patients, and she joined the social media campaign as she turned to Twitter and Facebook to encourage her friends and followers to join her in supporting the bill. Mavis’ passion and excitement about the bill brought her the invitation to sit on the Google Hangout panel discussion with Lord Saatchi and other patients, family members and medical experts. The Saatchi bill could revolutionize the way patients are treated in Great Britain. “This bill will not cure cancer, but it will encourage the man or woman who will,” said Lord Saatchi. In Mavis’ case, doctors could look beyond mesothelioma-approved treatments and consider treatments that have been approved for other cancers or diseases, such as breast cancer, that share some of the same characteristics as her cancer. The bill will allow doctors to implement new methods of use for an old medicine. “That is more than a doctor would dare do today without the bill because they fear they could be sued,” Mavis explained in an email to MesotheliomaHelp. Mavis’ outreach prior to the public consultation event had a snowball effect leading Lord Saatchi to highlight mesothelioma during the event. Mavis extended a personal invitation to Brian Sullivan of Verastem, a U.S. pharmaceutical company. Sullivan, in turn, invited Professor Dean Fennell, one of the world’s leading mesothelioma researchers, of the University of Leicester, who was then asked by Lord Saatchi to sit on the panel. Sullivan and Prof. Fennell collaborate on the global clinical trial COMMAND (Control of Mesothelioma with MAiNtenance Defactinib). Many late-stage cancer patients and other seriously ill patients, whose best chance at an effective treatment are clinical trials, are shut out of Phase I and Phase II clinical trials in the UK. Professor Fennell was asked if the bill would make a difference for clinical trials. He said he hopes that with this bill when researchers and doctors see “encouraging, exciting results in a drug,” they may be able to follow the U.S. by allowing a drug to be approved without a full trial. “I’m terminally ill anyway, and I’ve signed a consent form, so why can’t I have a Phase I trial,” added Mavis. “I would try anything,” she said later in a BBC interview. Mavis recounted her whirlwind day at the Parliament in her daily blog, Living with Mesothelioma. She and her husband Ray, who accompanied her, were up at 5:00 am and were not back home until 8:30pm. Mavis had a very full day in London of sitting on the panel, being interviewed by various newspapers and journals, being photographed with the group, and still more interviews. All of the resulting articles have been highly popular in Great Britain, and throughout the world. Even several days later, Mavis continued to champion the cause for mesothelioma, as the media vied for comments directly from her, and she sat for interviews with the BBC and the local newspaper, the Kent Gazette. Twitter and Facebook continue to light up cheering on Mavis Nye, and encouraging the woman who, while fighting for her own life, is making a difference for all mesothelioma patients. “You were extraordinary, and I take my hat off to you,” Lord Saatchi said to Mavis in an email after the event. Tune in next week: MesotheliomaHelp goes into detail about the Saatchi Bill and how it will benefit patients in the UK. Read Mavis’ inspiring story as she fights mesothelioma and enjoys life with Ray and her family. Visit the “Take Action” section of the Saatchi Bill on Tumblr or the Medical Innovation Bill comment section via the Department of Health to show your support. Also, follow @SaatchiBill on Twitter or on Facebook for daily updates. About the Author - Nancy MeredithNancy is a blog and content writer with more than 20 years of professional experience. Nancy has been writing about mesothelioma and cancer for close to five years. Follow Nancy on Google+, Twitter, and FB.